Social media and the beauty industry go hand in hand. After all, beauty brands represent many of the most-followed, active accounts on Instagram in particular. And as it should come as no surprise, those same brands are making a killing having mastered the art of social selling. Rabid, engaged followers that are more than happy to spend. What more could a brand want? Of course, the opportunities for beauty brands also signal just how competitive and cutthroat the space can be. And while there’s plenty of attention to go around on social media for beauty brands, creating that sort of devoted, cult-like following requires careful attention to detail. That’s why we’ve broken down the in’s and out’s of social media and the beauty industry for brands looking to stake their claim. From content ideas to techniques to streamline your social presence, we’ve got you covered. As a result, the beauty brands thriving on social media aren’t the ones blindly blasting deals and bland product photos. Below are some compelling ideas that are staples of social media and the beauty industry. Any combination of these posts is perfect for a beauty brand’s content calendar. Most beauty content on social media is undoubtedly product-centric, but what keeps this from being excessive or off-putting is the way these brands also add value for their audience. Instead, brands educate followers via how-to’s and tutorials. Such how-tos provide an engaging medium to show off products in action. But rather than rely on in-depth tutorials, social media and the beauty industry is all about entertaining, bite-sized how-tos. This tutorial from MAC Cosmetics on Pinterest is a concise example of the sort of share-worthy content beauty brands put together for their customers. Mini beauty lessons are all the rage on Instagram as well. Whether through short videos or Instagram Stories, brands have a prime opportunity to allow their customers to serve as their creative canvas in a matter of seconds. Some brands even publish promotional content akin to traditional commercials, much like this Instagram video from Overtone. The creative possibilities for how-to’s and tutorials are seemingly endless on social as brands are constantly cooking up new ideas. Beauty brands know all too well that their followers are oftentimes their best billboards. As a result, user-generated content is the bread and butter of social media and the beauty industry. Encouraging followers to tag themselves in photos not only serves as social proof but creates a steady stream of organic ads to seal the deal with skeptical customers. It’s no coincidence that many brands’ social are composed almost entirely of user-generated content. Through hashtags, such companies can create a powerful army of brand advocates to shout them out time and time again. …and on their homepage, where selected images have a chance to get featured via their on-site lookbook. In short, hashtags and UGC are crucial to creating a much-needed sense of advocacy and community. Beauty brands are proof that social media contests aren’t going anywhere. A way to both encourage new followers and reward their current ones, there’s a reason why giveaway posts are often the most liked and commented-on for many brands. Giveaways are more about just creating buzz and hype, though. Tag-a-friend contests and giveaways that encourage UGC are low-hanging strategies for brands to instantly introduce themselves to entirely new audiences. Frequent giveaways provide followers a reason to stay engaged and keep their ear to the ground about what you’re going to post next. These one-off interactions can sow the seeds of long-term loyalty. In addition to pushing products, thriving beauty brands also understand the importance of community. That is, speaking your followers’ language and connecting to them on a personal level. That’s exactly why text overlay posts, memes and inspirational quotes are peppered throughout so many beauty feeds. These provide an opportunity to show off your brand voice while giving followers a break from being sold to. Whether humorous or otherwise, they’re a great place to show the human side of your brand. With so many brands fighting tooth and nail for new followers, the trends surrounding social media and the beauty industry are constantly changing. And although the content highlighted above is a solid starting point, what specific strategies define the best-of-the-best in the beauty industry? Video marketing is oftentimes a sort of boogeyman for brands who see it as too much of a financial investment. The reality, though? Although Instagram is rightfully considered the go-to network for beauty brands, YouTube is simply too big to ignore. With tutorials from professionals and amateurs alike racking up millions of views, the platform’s community represents a massive window of opportunity. As evidenced by Instagram tutorials and the popularity of beauty vloggers, video content doesn’t necessarily need to be a massive production. Some vloggers manage to create compelling content with little more than a smartphone at their disposal. Considering that video content is the most engaging across all social networks, brands can’t afford to shy away from it anymore. The rise of Facebook Live and Instagram’s own emerging Live platform highlight once again the need for brands to play the role of director. Influencers are synonymous with social media and the beauty industry. Working with influencers is oftentimes a win-win situation. Brands are able to introduce themselves to highly engaged audiences, while the influencer gains clout from working with an established brand. Influencer content typically performs well for the same reason that user-generated content does. That is, their posts feel organic and show off your products in a compelling way. The key is to find influencers that align with your brand, goals and budget. On that note, influencer marketing does not have to represent a massive investment to pay dividends. Smaller influencers with a few thousand followers may not necessarily look like much on paper, but often beat out bigger names in terms of engagement. Either way, brands interested in influencers should test the waters first before splashing a ton of cash. As noted earlier, a distinct brand voice is a must-have for any beauty brand. According to Sprout’s own data, followers appreciate when brands get real with them. Keep this in mind when crafting captions and creating content that speaks to your followers on a personal level. Rather than just “play it safe,” don’t be afraid to get bold with your audience. Ask yourself: what are you saying that’s going to help you stand out from your competitors? Branded hashtags are a critical aspect of social media and the beauty industry. However, even the biggest beauty brands understand the power of tapping into tags beyond their own. For example, niche hashtags such as #unicornhairdontcare and #selfcaresunday represent potential goldmines for companies looking to get their products in front of new people. 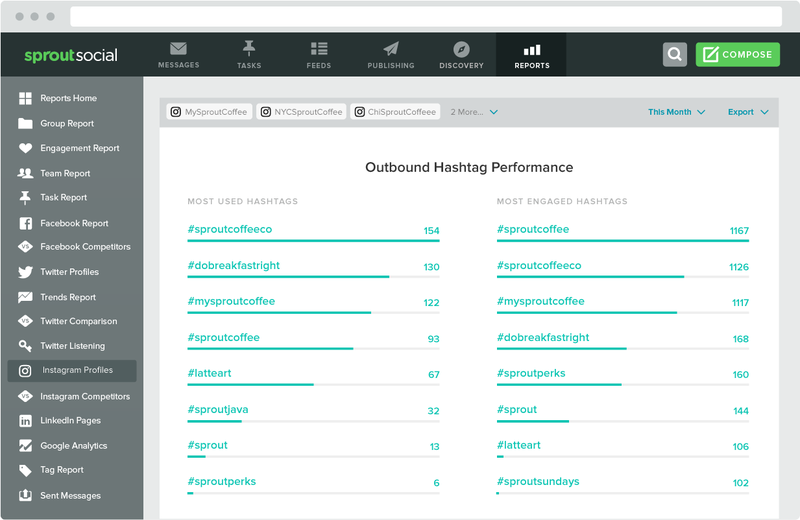 With the help of social analytics from Sprout, you can hone in on hashtags that make sense for your brand and monitor your growth. This allows you to fine-tune your tagging over time and experiment with new ones at the same time. Social media has become a staple for just about any beauty brand out there. However, even massive names like Sephora didn’t grow their follow count by accident. If you want to give your follower count a much-needed boost, you need to be aggressive about promoting your social channels outside of social media itself. This is key to converting one-off customers into long-term followers. 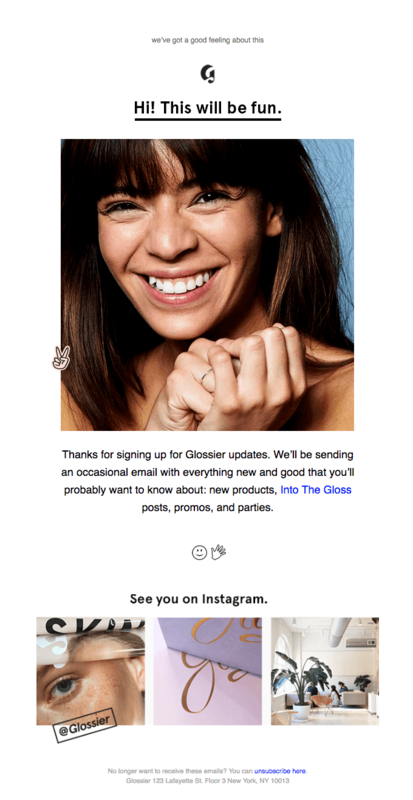 For example, this welcome email from Glossier puts their Instagram presence front and center. Scoring those followers is valuable for brands who want a constant line of communication. Whereas customers might get tired of emails day-after-day, seeing a social post or two on a regular basis isn’t going to bug them. On-site mentions of your social presence beyond sharing buttons are also fair game. Below is another example from Glossier’s site. Again, lookbooks continue to gain steam as brands strive to sync their social content with their online stores. This ultimately results in more organic advertising and an increase in conversions. In short, another win-win. Beauty brands juggle a ton of content. 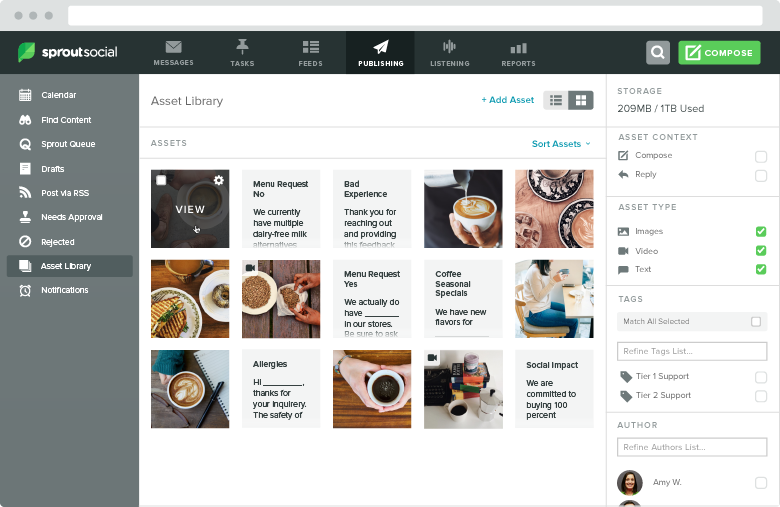 Between product photos, user-generated content and promotional announcements, a strong sense of organization is a huge plus in managing your campaigns. In addition social scheduling and keeping a content calendar, beauty brands can majorly benefit from putting together an asset library. Doing so ensures a sense of consistency when publishing across platforms or dealing with customer concerns. Having templates and creatives stored in one place results in saved time and less stress involved with growing your social presence. And with that, we wrap things up! What’s next for social media and the beauty industry? There are few spaces more reliant on social media than the beauty industry. With so much competition and so many creative options, a concrete social strategy is a matter of “when,” not “if” for brands in the space. Hopefully this guide was a much-needed dose of motivation and inspiration for what a successful social strategy in the beauty space looks like. We want to hear from you, though! What do you see as “the next big thing” on the horizon from beauty brands? Live video? More creative social selling? Let us know in the comments below!